Hi Juliano.....ha..ha..I have the same problem as you...mine are now about 2" high with one set of leaves...I shall pinch them out as the next set develops. When I planted these in the pic.....we hadn't been here long and I just dug the ground over...threw half a bag of compost in the trench and stuck them in. I fed them every two weeks and just kept cutting the flowers. Chicken waste can be a bit strong and burn the roots....but if these are special pellets...then should be fine. Lovely! 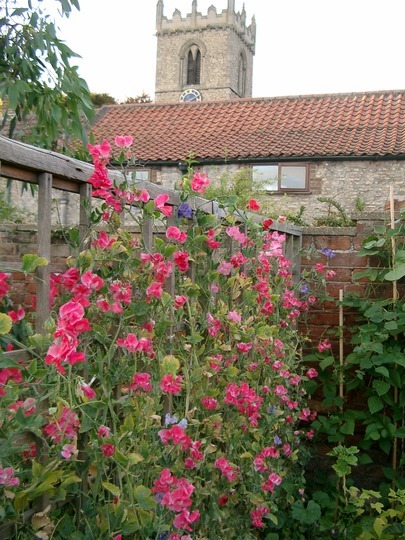 I grew some sweet peas from seed, they are in the greenhouse waiting for the spring! Yes mine are B_lourenco....I pinched the tips out and they're coming on now...just a little more warmth. What sort have you grown? i've chucked aload of seed on the garden in my wild patch i'm hoping they'll do there own thing. i brought some small plants this year and they had hardly any flowers on them. This photo is of species lathyrus. See who else has plants in genus Lathyrus.